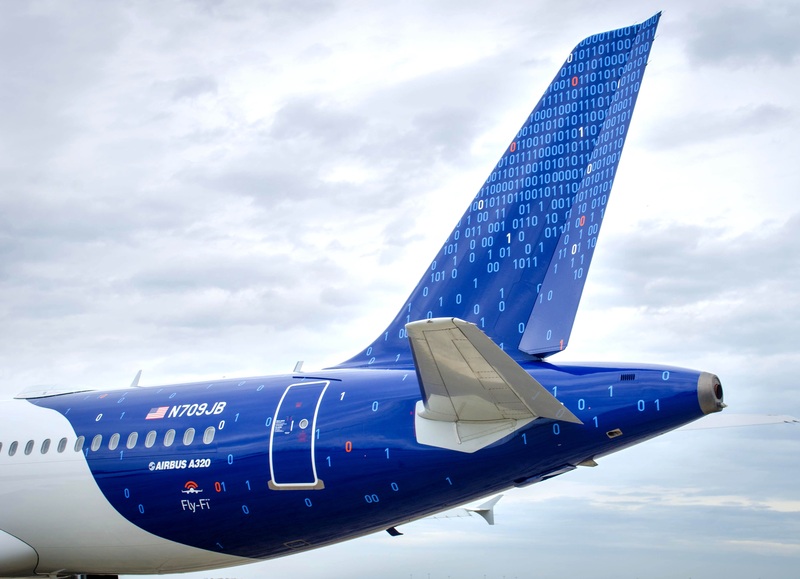 JetBlue continues to innovate in the airline industry. Here's their latest update. What is the first thing that comes to mind when you think about JetBlue? Ever since the airline launched in 2000, they’ve placed an emphasis on amenities; doing everything possible to create the best in-flight experience for passengers. For us, that’s what we think of. Those amenities. Free live TV at every seat, free satellite radio, and unlimited quantities of snacks you actually want to eat. Those factors, combined with their stand-out customer service, is the reason JetBlue has ranked higher than any other airline in the JD Power North America Airline Satisfaction Study for 10 consecutive years. So when JetBlue started investing in their in-flight WiFi infrastructure back in 2007, it was no surprise that they offered it to customers for free. In fact, the airline became the first U.S. domestic carrier to provide complimentary WiFi, starting with “BetaBlue“, an A320 aircraft equipped with an onboard wireless network. That test run of in-flight WiFi was a clear indication of JetBlue’s commitment to connectivity, but it took time to get it right. Seven years later, they finally did…and it actually works really well. Free wifi on my @JetBlue flight this morning. Called "fly-fi" & in beta testing I believe. Such a fun name and working so well. Love it. The new and improved JetBlue Fly-Fi program is still in its beta phase as they roll out the service to their entire fleet. The airline also makes it easy for you to find out if your flight will have free WiFi before you head to the airport. JetBlue offers two variations of its WiFi service, Simply Surf and Fly-Fi Plus. Simply Surf offers basic web browsing free for all passengers, while Fly-Fi Plus is $9/hour and only necessary for Netflix and other streaming services. On #ConnectionDay, JetBlue has partnered with Verizon to offer free Fly-Fi Plus level WiFi to all passengers flying on November 26. But the airline is just warming up their WiFi offering. On November 24th, 2014, it was announced that JetBlue has formed exclusive partnerships with Time Inc. that will give passengers on the WiFi network access to InStyle, Real Simple, Southern Living, Essence, Health, Travel + Leisure, and Golf magazines. As the program rolls out and grows in 2015, other major content producers will become part of the Fly-Fi Hub, including publishers National Geographic and HarperCollins. When JetBlue announced last week that they would start charging for checked baggage and cut down on legroom, the internet let out a collective sigh of disappointment. It was a rare moment for JetBlue to follow the lead of their more conventional airline peers rather than blazing its own path. Naturally, customers and brand advocates aren’t happy about the change, but every cloud has a silver lining. If you ask us, that silver lining is the airlines emphasis on technology. If you fly on JetBlue in the near future, your aircraft will likely have 100 channels of Direct TV (currently 36), 10.1″ screens for every seat (currently 7″), 100 channels of Sirius XM radio, and free WiFi with a variety of exclusive content. Don’t worry, each seat will have outlets and USB ports for charging too. The SocialSign.in team is excited to see how the JetBlue Fly-Fi Hub grows and offers new, unique value with its engaging passenger entertainment. As a business that understands the power of WiFi as a channel, it’s refreshing to see a major brand use it in a unique way. To learn more about the unique ways a business can leverage their WiFi network, visit our website. If you liked this blog post, you may enjoy reading some of our other related content. READ: Do the 50 Busiest Airports in North America Have Free WiFi?